In mid 2017, legendary crime writer Michael Connelly introduced Detective Renee Ballard, a brand new series protagonist who was marooned on the 'late show', the midnight shift in Hollywood, after laying a sexual harassment complaint against a superior. Ballard is a fierce and fascinating heroine, who shares some traits with Connelly's greatest creation, Hieronymous "Harry" Bosch, while being her own unique person. 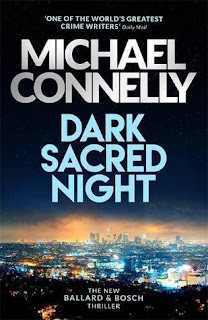 In DARK SACRED NIGHT Connelly brings Ballard (book 2) and Bosch (book 31 or so) together for an exciting crossover tale that shows the modern-day master is still at the top of his very considerable crime writing game. It's an intriguing 'compare and contrast' between two great characters, both lone wolves by nature who are willing to do whatever it takes to find justice. The book switches perspectives between Ballard and Bosch, giving us an inside-outside look at both characters. How Ballard sees Bosch is different to how he sees himself, or readers may see him, and vice versa. The pair initially meet when Ballard rumbles Bosch late one night when the ageing investigator is scouring old files in Hollywood station, hoping to find clues to crack a brutal cold case killing. Almost a decade ago a teen runaway's body was left like trash in a alleyway dumpster. Now the runaway's mother is staying with Bosch and he's trying to do anything to salve her destructive grief. After some initial wariness, Bosch and Ballard recognise something in each other, unofficially partnering up on cases old and new. As is often the case in Connelly books, the detectives can't focus on a single case - it's a real-life workload as they juggle multiples crimes and cases, even as they try to chip away at the investigations that particularly get under their skin. Some days may be tedious, others may be life-threatening, and the path towards solving a case is often anything but clear. This is a hugely enjoyable and engaging read. Connelly creates a compelling storyline that hurtles along while providing plenty of character insight too. It may have seemed a bit early in Ballard's existence to bring her into Bosch's orbit, but it works. The interplay between the two cops is really interesting - they're alike in some ways and very different in others. Each have suffered at the hands of superiors in the LAPD bureaucracy, but for quite different reasons and motives. Around the time that DARK SACRED NIGHT was released last year, Connelly was presented with the prestigious Diamond Dagger from the Crime Writers Association, which recognises "authors whose crime writing careers have been marked by sustained excellence, and who have made a significant contribution to the genre". Connelly may have been one of the committee's easiest calls in years. His crime tales are both timely and timeless, addressing deeper societal issues alongside the struggles and humanity of his characters. DARK SACRED NIGHT is a new classic in a career filled with them.